Need to increase your slide on sticky approaches? 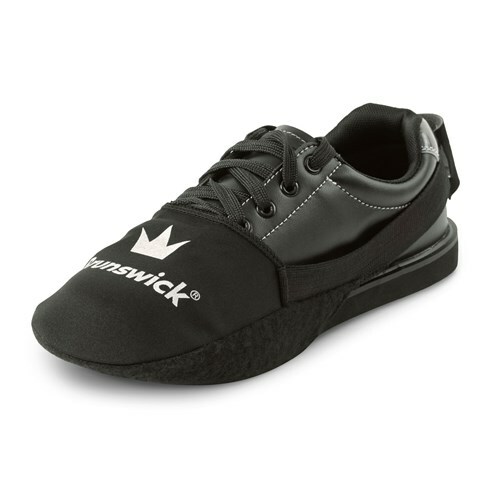 Check out the Brunswick Shoe Slider. This accessory slips over your shoe and uses suede like material to extend your slide. I've tried several different brands, but this is the best for me. I use it for a more consistent slide and keep an extra one in case it gets dirty. This is my first slider and I am loving it! No more sticking on the approach! I would not recommend washing this product if you can help it. Washing the fabric can cause the fabric to become a little more brittle and it could lose the elasticity over time. Will they be effective on regular tennis shoes? I would think you would be able to use these on regular tennis shoes without a problem. Does it cover the heel? The front of this will pull over the front slide of the shoes. This is only intended to cover the slide on the bottom of the shoes. There is a hand that extends back over the heel but this band is just to hold the front part of the slide on the shoes. will this work for left handed bowlers (right shoe)?? Will these fit both mens and womens shoes? Due to the time it takes to produce the Brunswick Shoe Slider ball it will ship in immediately. We cannot ship this ball outside the United States.